We knew the only choice was to get the engine out and replace the oil seal. As I’d brought my fiancée in the car, I had to balance keeping her from getting bored out of her brain trackside and getting her home, with helping as much as I could. The delicate balance many of us drivers face! 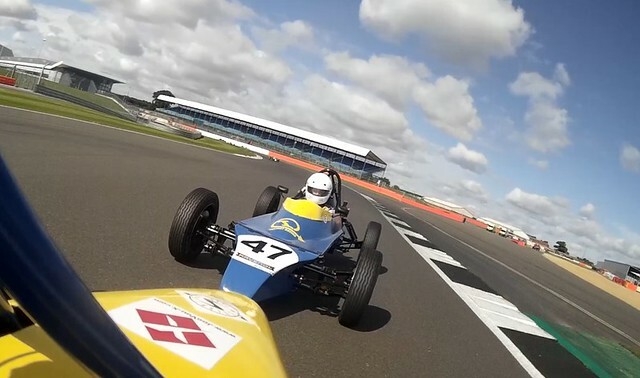 Thankfully, and as is always the case with the helpful Formula Vee paddock, James Harridge, Jake Hockley, and my sister Michelle all got stuck in. By the time I left, the engine was back in and Glenn doing his thing building it all back up. You can see how hot the flywheel had got with the slipping clutch! I blasted back to the track on my ‘sensible’ Yamaha FZR600R on Sunday morning to find the car sat ready and waiting to go. I had another good start, but being on the inside of the pack in turn 1 I was a bit cautious as I didn’t want to risk spinning into everyone else. I think I am pretty good now at warming my tyres up before the start, and perhaps I should trust them more? I lost out a bit in the jostle for position, but could see Andrew Cooper ahead who I thought must be 2nd in Class B, and Colin Gregory and Mark Lawton were also all in the mix together, with Bill Stenning, Martin Snarey and Jamie Harrison completing a monster battle of B Class cars! On the second lap Ian Rea came absolutely flying past me and disappeared down Hangar Straight. Unfortunately, he then misjudged his closing speed to a slowing car, spinning in the middle of the track on the corner entry. This caused all kinds of havoc behind, as I slammed on the brakes and dived to the outside, and Bill Stenning came sliding through on the inside. There was then what looked like a car-width of a gap between Bill and Ian, and so I stamped on the throttle and got through the middle! All the commotion meant I’d dropped off the back of the pack, and had become the new leader of the chasing group. I got my head down with clear track ahead and pulled out a safe gap. It was at this point I realised something else wasn’t quite right. Normally I would get faster and faster – especially on my own with clear track – but despite pushing harder my lap times were the same. I actually set my fastest lap on lap 3! I thought this was probably the tyres – they’re almost ready for the bin, so I’m sure they’re not giving great grip any more (they’ve served me well for 2 seasons, though!). I later found out the pressure is also quite badly down on one cylinder, so these probably account for the lack of pace. Despite this I did chase down Colin Gregory, and then a few laps later was all over Mark Lawton’s Scarab. I braked late and went up the inside of him into Stowe and eventually survived his fight back and pulled a slight gap. Still with clear track ahead, I could see the blue and yellow Sheane of Jamie Harrison cutting through the field behind. I was watching and hoping he’d get tangled up in battle with Bill and Mark, but with 2 laps to go he must have caught sight of me and the final B Class podium spot, and caught me by almost 2 seconds a lap! He got me going onto Hanger Straight, but I used the slipstream to glide back past him into Stowe. Being on the inside line, I must have been on the brakes a bit too long, as he went in deep and got to my outside, meaning I couldn’t get back on the power or open out the steering for the exit! I pressured him into the complex hoping to force an error, but he stayed strong. I was stronger, however, taking a beautiful line through as I waited to take advantage, and as we came onto the pit straight I had a great run. I dived out of his slipstream and powered past, the move done before the start line, and got through the first few corners until I saw a marshal wave again! I’d missed the chequered flag again, and knew I’d got over the start line ahead – but again the finish line is before that! Jamie had got me, much the same as Martin in the first race, by less than 2 tenths of a second, and he’d taken 3rd in class B from me! After a race like that I can’t even say I was disappointed, though. Despite the dodgy tyres , power loss, and losing a podium spot on the last lap, I’d had a great race! It’s funny how that works out sometimes! In fact I almost forgot – I finished 18th overall and 4th in class. Next we’re headed to Rockingham on the infield track of the super speedway. It’s a track many hate, and it’s very hard on engines. Having done around 200 laps there on bikes, the place grew on me slowly, so I’m looking forward to trying it with 4 wheels!